The HP-85 was a famous all-in-one computer which met a great worldwide success thanks to its high reliability and ease of use. 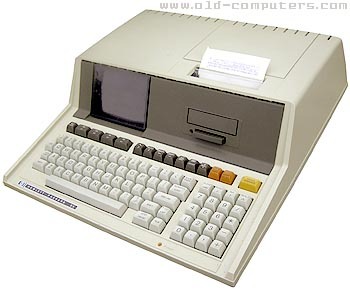 It featured a 8 bit processor, 16 KB of RAM, a built-in 5" CRT display, tape drive, thermal printer and four I/O ports. The HP custom processor had 64 8-bit registers but no accumulators. Even slow, it offered outstanding performances in math calculations. The display offered a full screen editor and and a ROLL key allowing to scroll the screen window up and down through a 48 line (three full screens) buffer . The quiet and quite fast printer could print a hard copy of the screen in text or graphic mode as well as direct programs outputs. The built-in tape cartridge system used a common DC100 data cartridge that could hold 195 KB of program files, binary files or data files. Up to 42 file names could be stored in the directory of the tape. A searching function made a file to be found in less than 1 mn. When the system was switched on, the tape drive automatically searched a program called 'Autost' and ran it if found. HP also provided a large range of interface modules to be plugged in the expansion slots. The system could then manage several peripherals through GPIB or Serial ports: FDD unit, printers, plotters, etc. A 'ROM Drawer' module allowed up to six ROM chips to be inserted. They expanded the capabilities of the internal BASIC interpreter, provided additional languages (Assembler, Pascal), and I/O routines for external devices. A quite special "feature" of the HP-85 was that the screen blanked whenever the printer was printing or the cartridge was accessed! see more Hewlett Packard HP-85 Ebay auctions !